The Corps of Royal Engineers celebrated their freedom of Gibraltar at the weekend. 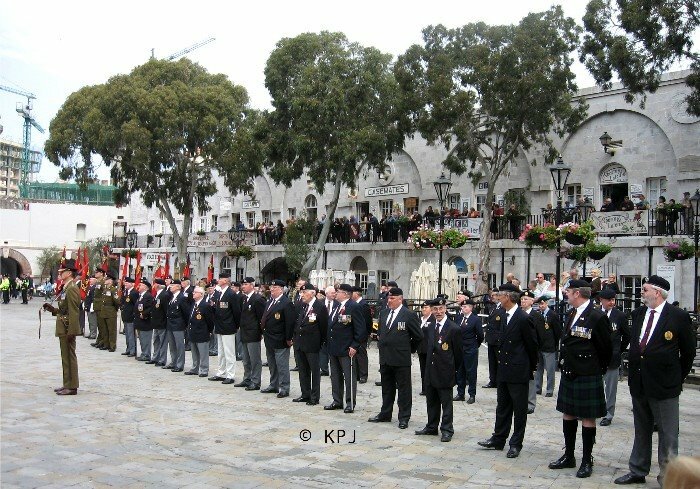 On Saturday they assembled in Casemates Square, with the Band of the Corps of Royal Engineers and the former serving members of the Royal Engineers who are now in the Royal British Legion, Gibraltar branch. The band had performed a concert the previous night in St Michael’s Caves. After listening to them in Casemates I regretted not having made the effort to go to the concert. I used to like military bands, but as I grew up and associated the music with war, I distanced myself from it. 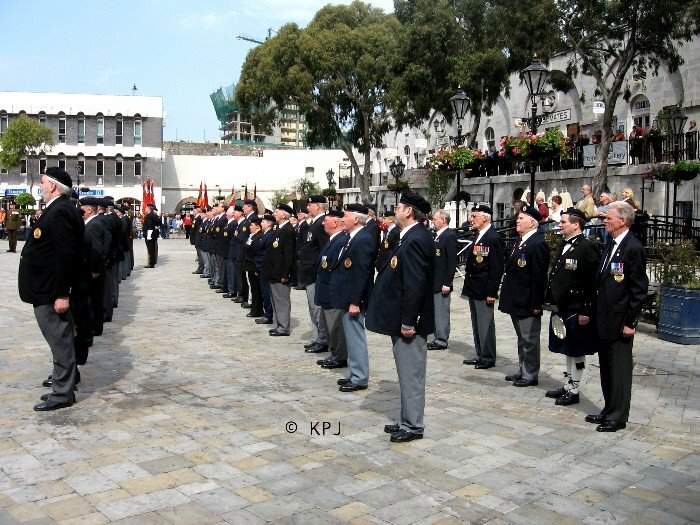 But they were very good and played a great range of music in Casemates – for free – while the Chief Engineer inspected current serving REs and RBL members. 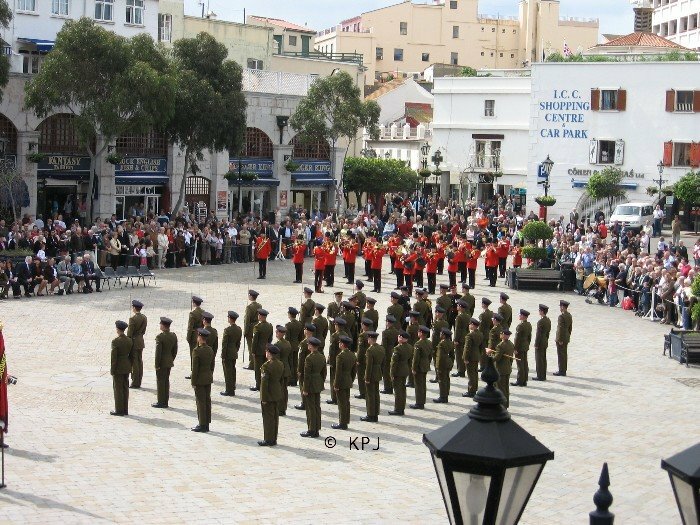 The Royal Engineers were granted the Freedom of Gibraltar in 1972. They have a long history of involvement with Gibraltar, from raising the first corps in 1772 to digging out many of the 30 miles of tunnels within the Rock. They celebrate their freedom every two years. This year they were inspected by Chief Royal Engineer, General Sir Kevin O’Donoghue. 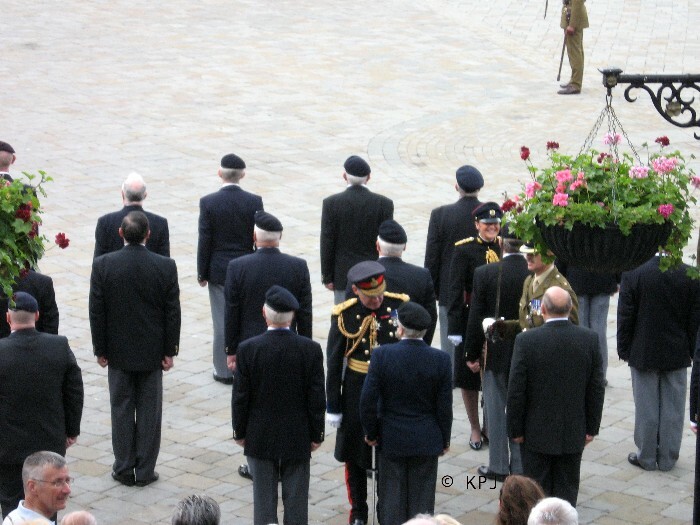 After the inspection finished, the band marched up Main Street, followed by the Corps of Royal Engineers, and then the Royal British Legion, who were applauded as they marched around the corner to the final destination in Cathedral Square. Partner spoke to one of the RBL members in the pub on Sunday. We were surprised he had been in the parade as he is in his late 70s. He admitted he was finding the marching a bit hard as he got older. So very well done to him and all his colleagues who turned out for the parade. You all deserve our respect. And here are two vids. In the first one the police officer half way through is saying “Avoid them”. To me. I was so busy trying to get the rest of the band going round the corner I didn’t realise the Royal Engineers complete with bayonets were rapidly bearing down on me. Finally, the Royal British Legion finishing the parade in Cathedral Square to well-deserved applause from all the bystanders. You mentioned you were in Gib in 1972. I Was born there in 1972 as my father was posted there for 2 years. He recently passed away and I’m trying to find anyone who knew him. His name was Colin Jones, Pte, Serving with 1 RRF. Worked on the top of the rock. Also looking for others by the name of Townson as they became my god parents. Do these names mean anything? I was also on the original parade though normally a shift engr in Calpe Hole Power Stn. The stn was "mothballed" before I left Gib in Aug 72. I now live in Spain & usually visit Gib once a week. I have revisited the stn in the Gt North Rd and its now in a very sad state. Still, fond memories remain. Thanks for your interest Joseph. When you visit Gib, do you ever get to the Angry Friar as there a few ex Royal Engineers who go in there regularly? My partner goes in there and chats to them at least once or twice a week.I am very saddened with the state of the military heritage, there is so much, but so little that is well preserved. Perhaps one day.It would be good to bump into you. I to was on the original parade in 72, Terry,who was a diver if I recall should remember me. Had two enjoyable years in Gib, been back once in 2002 I think it was, Governors Cottage camp was still there then, doubt if it is now, wonder if the old 1772 club is still there? Vikki, hi. I do remember Nick and Dot. We dived together around Gib and off Morocco. AnthonyI take it you are Tony Jordan who used to work at the boat sheds. Good to hear from you. I will be in Gib from 10th July for a few days. hallo terry,its rocky hudson here,remember our whaler pulling days,in the bay,? i have some pics with you recieving a trophy,ill get around to scanning them when i get time,im busy on the PMC circuit at the moment,happy days! You mentioned you were in Gib in 71-73. I Was born there in 1972 as my father was posted there for 2 years. He recently passed away and I’m trying to find anyone who knew him. His name was Colin Jones, Pte, Serving with 1 RRF. Worked on the top of the rock. Also looking for others by the name of Townson as they became my god parents. Do these names mean anything? Alan and Paul, thanks for your comments. 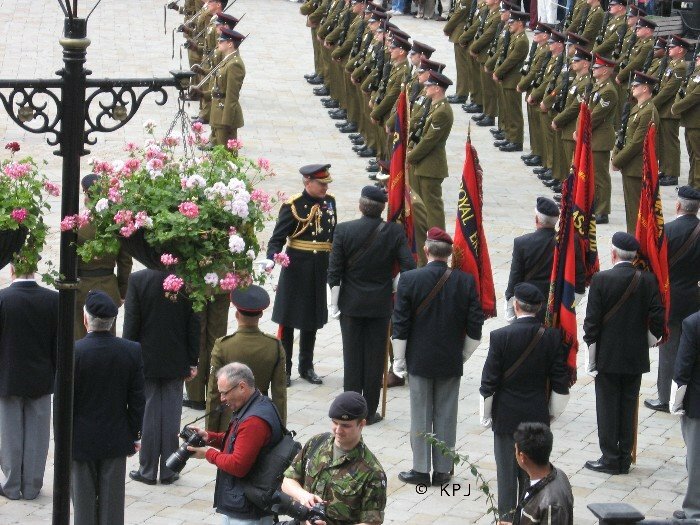 Hope you and everyone else have enjoyed reading about the REs parade a few years ago. I'll try and take some photos of the parade next year for an update.Terry, hope you had a good few days when you visited gib in July. I was in Gibraltar last year for short visit, shame about the condition of Calpe Hole power station. Number 2 generators engine has just been left as it was when I stripped it down in 1971 to find a broken crankshaft. Terry is the only ex fortress Sapper I have been in contact with. Hoping to visit Gib again while I can still manage it. As I said above, a shame about much of our military heritage here, although sometime it does get the odd facelick, but I would like to see it higher on the priority list. It’s an integral part of Gib’s history. Thank you for your virtual visit to the blog, Jim, and hoping you get back here for another visit soon. Whatever the flaws, it’s still a great place. Jim Hyslop.Your name sounds really familiar.Im John Lewis.Used to be in 1st Fortress and was a shift engineer at Calpe Powe Staion.Stil here in Gibraltar. Regards,hope to hear from you. Hi Robert,John Lewis here from Gib.Contact me if you want through the site.Regards,John. 40 years and still miss the rock ! not the pub in the square ,I was a plant opp, building the europa rd in 72 from using blast mats to being on the crusher all day, ,Great time Great set of lads .Also the times we had in the 1772 club Magic ! Thanks for the comment paul (I take it you are from Newcastle? – lived there for ten years or so). It’s funny how many people in the REs have actually moved here or retired here. Didn’t realise Europa Road was so new. A mere 40 years old!! Looks like it has been there for ever. Good to see Paul I still around. The pub in he square he refers to was The Old Rock. Works section did a lot of work on the Europa by pass and I agree, the 1772 Club was a cracking place. Thanks for your visit and comment. Amazing how Gib has changed over the last ten or twenty years. Even when I first visited some twenty years ago it was a different place. Must ask some of our older colleagues about The Old Rock and the 1772. The Old Rock that brings back memories. Sapper local side of the places.ilI was in power station troop 1972 on parade. Paul (yorky) Hepworth. just found this page i am a member of the REA gibraltar branch i help change the 1772 club from a workshop to the club served as a tunneler from 1964 till 1967.i parade every year and march on freedom day lived on the rock for 51 years. my farther robert john janes. who has now passed away last year. was at gibraltar in 1972 for freedom of the city .he was in the R.E band he played the saxaphone. i still have a bronze medal or commemorative medallion number 61 out of 200 in a red spinks box. also some first day cover stamps and a booklet. Thanks for your visit and comment Iain. Quite a few ex REs seem to find this page, so always happy for people to use it to catch up with each other and if you, or anyone else want to post any photos, happy to add those too. Hmm, don’t know why that is, will have a looky. It’s a while since I posted on here, but since the last time I have talked to Jim Hyslop a couple of times. Good to hear that Paul Lynn is still around but who is anonymous of Works Section? It was Works section who built the retaining wall on the Europa by-pass. Other members of Works section were Colin Brewer, Pete Moran, Tiny Cummings, Brian King Mick Ratcliffe and Phil “lungs” Crook amongst others, as well as Rocky Hudson who has posted previously. I will be on the Rock from 16th October 2014 for a week. If anybody happens to be around, let me know, you probably owe me a few beers. Names from the past. all of them on the works section although I was a shift engineer at the time..71-73, Alan Hodge although moved down to the dockyard when they closed Calpe on me and I remember Jim Hyslop and John Lewis. Alan,your name rings a bell but I cannot place your face.I was 1st Fortress-Power Station Troop from 1969-1972.Lets see if we can reminisce a bit and maybe send some photos etc. I’m really pleased that REs have found this post and been able to share and remember time in Gib. My dad enjoyed his time here (RN). If any of you want me to put up a post using photos (all credited and copyrighted to you or the original photographer) and any specific memories, I’m happy to make a post out of it. Thanks to you all for your continued visits and comments. I was in the next building Powerstation Troop later E&M Troop. I started off in Calpe hole then dockyard ps building a new Mirrleese generator I have the odd photo. Best posting ever remember Jimmy Donigan Chris Jarvis. Paul (yorky) Hepworth. My name is Philip Meigh and I was a Cpl clerk 1976/77 in 1st Fortress Squadron based at Governors Cottage Camp. I was looking at this site purely to see if the 1772 Club still exists but no joy so far. It was a brilliant Club and was cared for by the Squadron at that time. I went back to Gibraltar in 2011 and saw Rosia Bay swimming pool built by the Royal Engineers but did not get near the 1772 Club. I would be grateful for any information or contact by anyone who was in the Squadron at that time. Philip,I was with 1st Fortress from 1969 to 1972.I have resided in Gibraltar since 1973.The old 1772 club building is still there,but its not the 1772 anymore. Now empty and for sale, shame. Was there 71/72 With 3tp 60 Sqn. Back there 3-7 May 2015 for a visit and to look at property. Sorted. Do you want me to delete the second? If you are looking at renting or buying here, feel free to ask on this post or contact me. No, I don’t work for estate agents! I’m an editor, but happy to give any tips for free about property. I certainly remember John Lewis. When I arrived in August 1972, I was given a bed opposite him on the ground floor of the pent house. I seem to remember john was a bit of space fanatic and had built a model of the moon lander which he on his bedside locker. Why does such trivia stick? grins. Yes,thats me Terry.Still got one of those model lunar landers at home,here in Gib where I now reside. I’m trying to find out a bit about REs in Gibraltar in about 1870. Can anyone tell me if an RE’s girlfriend or finacée would have been allowed to visit in those days, or was it only wives who would have been given a ship’s passage? Were there work prospects for young English women in Gibraltar in 1870? Or might a young English woman have been sent to Gibraltar as a convict? A female relative of mine went to Gibraltar about 1870, married an RE in 1871 and had a baby girl there in 1873, and I’d love to find out what took her there – is it likely she already knew him or more likely she met him out there? Are there any ships’ passenger lists I could check, or Gibraltar immigration records? And finally, which RE regiments were in Gibraltar in 1871? Any help very gratefully received! A fascinating new section of your biog, for me, Kate. Your regular biog email has twice now disappeared in to a ” Page not Found” heading and I clicked around till I came upon your review of the RE Freedom March and then a good browse through spotting all of the EX REs. but none from my time there ’60- ’63…. **The asterisks were inserted to remind me of that fateful day, Jan.3rd 1961 when I lost my best mate in a tragic drowning accident off the works site at Little Bay.. He was Spr. Mike Ward, aged just 19 and his remains rest today in North Front Cemetery . I saw, a few years ago, a cutting from the Gibraltar Chronicle of 3 or 4 of the original Squadron Members, still residing on the Rock, (Charlie Head, Jock Snaddon ) amongst others who had taken pity upon the rather forlorn brass plaque memorial attached to the newly laid concrete wall and had replaced it with a much larger one to mark the spot off from where Mike had died. Happier memories abound, meeting,” courting” and eventually marrying my first wife and our first few carefree months together, in the warm Gibraltar Sunshine. Sadly though,this was not to last but as they say, that’s life. So , gentlemen, and ladies, if any one wants to swap a few memories of days gone by, we can pull up the metaphorical sandbag, swing that Tilley lamp, and swap a few “Warry” Stories !! Hi Kate. I hope that you and your Partner (and the dogs) are well. I don’t have your email address so I hope that this will reach you via your blog. ” Cunningham” or drop an email to the address below,and we’ll take it from there. Great you are returning to Gib. How about meeting you up at the newly refurbed Wellington Front some morning? Say Sat or Sun cos it’s quieter, although I’m guessing the march is on one of those days :D But yes, I’ll leave a message. Anything else, you can use the contact form on my about me page which comes to my email. Hasta abril. I visit the Rock once a year at least, perhaps we could meet up sometime? I was part of the parade in 2008 and was wondering if i could acquire any picture or videos that you might have taken for the event, I lost my laptop a while ago with all my memories from that period. I would be very grateful if you could assist. simbarashe… You should be able to ask the Gibraltar Chronicle if they can help you as their photographer was very busy on the day at the parade ground. I managed to get a free DVD of the whole event made and provided by an RAF Corporal in his rôle of Official Photographer. I’ll try to look it out and If I find it will send it to you. I’ll reply to you in here if Kate doesn’t mind and we can PM each other if I need to. I was the troop SSGT of 1st fortress from jan 85 to April 87. Just had some great times in the 1772 club. Looking on Google earth it has changed so much and not all for the good. Hi Mick, thanks for visiting and commenting. First time we came was 1989 so just after you, but yeah it has changed. If you want to catch up with anyone do ask on here as people do use this post for getting in touch and I’m happy with that. Good site brings back memories. Hi Paul. John Lewis replying.Your name sounds familiar.Do you remember me?I was in power station troop.1969-1972.Regards. No don’t recognise the name l arrived 2 weeks before freedom march leas only up at Calpe hole about 3 weeks then went to dockyard ps with the civvis as an engine driver then help build a new mirleese generator then there was a general strike and all the civvis walked out. Best posting l ever had. Yes,best posting I probably ever had.I live here now,have done since leaving the Engineers in 1973’If you plan coming out let me know,maybe we could meet up.Regards,John Lewis. If I come over I will look you up been back 3 times for freedom march. Wish l lived there has governors cottage gone now? Last time l was there it was part of an incinerator. I was a little sad when I went up to Calpe hole it was just a pile of rust.jimmy Donigan and Chris Jarvis Dave Ronksley and WO Harris were there l worked with Celio Findlayson (civvi) down at the dock yard. I am on Facebook with some photos. Only bits of Governors Cottage Camp left.The old NAAFI( Nissan building) is still there,but only a shell. I believe Calpe was later used as a storage place for MOD transformers.I will try and contact you on facebook if you want.Regards,John. Ok John that would be good on fb as Paul Hepworth bye take care. I was on that freedom parade, got the medal thingy. I was a full screw chippy in the cavern, our married quarter was a delapidated hiring on Prince Edwards Road, not far from the Queens Cinema. I had some fun times in the 1772 club with the RRF wives, gordie girls up for a rumpy pumpy while their hubbys boozed up at the bar. Name sounds familiar.Do you remember me -John Lewis.Regards. Hi Alec, I think you were in Works Section and took over from Colin Brewer. Yes Terry, that was me. I served.for over 45 yrs in the Sappers. But Gib was one of my best. I’ve still got my bicentennial medal, and me and Isobel walked the march route last month. It was lashing down but we walked the walk. Goveners Cottage..gone, Lathbury Bks….gone, HMS Rook…gone. Loads of new builds by the dockyard…not for locals unless they have tons of money. It was good to go back. Hi Alec, good to see you around. I have been back many times and like you regarded it as one of my best postings. I left the army in 1991 after 27 years service. Merry Christmas.